Before you have children, Valentine's Day is usually a holiday that's all about romance. Once babies come into the picture, though, things tend to change. You might not be able to celebrate with an evening out on the town, or want to spend money on flowers, champagne, and fancy chocolates. Even if you do have romantic plans for Valentine's Day, you'll probably want to celebrate with your children too. 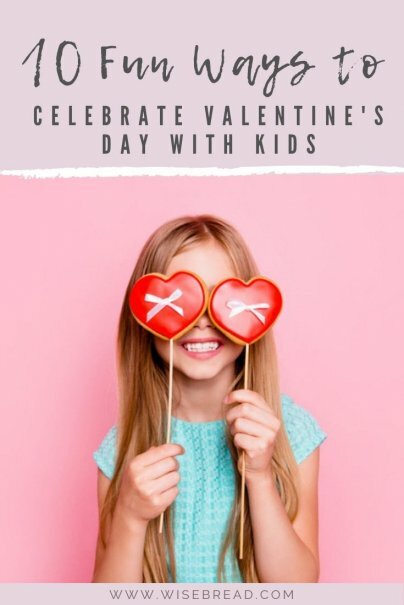 Kids love holidays and traditions, and there are lots of fun ways to make Valentine's Day special. You decorate your home for Halloween and Christmas, why not Valentine's Day? Head to your local dollar store for some inexpensive decorations like balloons and streamers, and then let your kids hang them up. You can decorate with items like flowers, ribbons, and tablecloths too. It's also fun to make your own decorations. Use pink, red, and white construction paper to make paper chains (like the red and green ones that are so popular at Christmas), and then hang them from the ceiling. Or let your children create some heart-themed artwork and hang it on your walls. You can always buy Valentine's Day cards, but if you've got the time, most kids enjoy making their own. One easy way is to cut a heart out of construction paper and then glue a white paper doilie on top. Let your children decorate these with markers, glitter, stickers, and candy hearts. You can also find lots of ideas for handmade cards online. Mail these cards to friends and family, or deliver some to a local nursing home and teach your kids how to make Valentine's Day special for someone else. If you enjoy making crafts, you don't have to stop with handmade cards. For young children, download printable coloring pages. For older children, visit websites like Kaboose and Family Fun to find pictures and descriptions of lots of great craft ideas. If you're looking for harder projects, visit the Martha Stewart website, where you can learn how to make embellished candy boxes or your own heart-shaped soap. Many games that are childhood favorites can be modified to include a Valentine's Day theme. For example, it's easy to find free printable templates for games like Valentine's Bingo or Tic-Tac-Toe. Make the games even more fun by using those cute little candy hearts in place of chips. It can also be fun to create your own Valentine's Day Scavenger Hunt by writing clues on paper hearts that lead to a special gift or treat. If you're short on time and looking for something super-easy, let your kids play some of the many Valentine's computer games that are available online. Valentine's Day makes a great excuse to indulge in some delicious treats, and cooking and baking provide all kinds of valuable lessons in many aspects of math and reading. Even little children can pour and dump, and older kids can learn to read recipes and measure ingredients. Make some heart-shaped sugar cookies and decorate them with pink frosting and sprinkles. If you prefer chocolate, try making chocolate-covered strawberries or easy homemade truffles. And if you're looking for a healthier option, now might be the time to see if your kids will eat this Red Beet and White Bean Hummus. It's hot pink — which makes it perfect for the occasion! Once you've got the house decorated, the games planned, and the treats prepared, why not host a Valentine's Day party? Invite a few friends or just the stuffed animals. Plan to play some of the games and make some of the crafts listed above, and then serve treats with heart-themed plates, cups, and napkins. Use heart-shaped cookie cutters to make heart-shaped tea sandwiches, and don't forget to mix up a sparkling pink punch. Family traditions provide children with a sense of security and belonging, and are fun and rewarding for the entire family. A tradition can be as simple as having breakfast together and serving heart-shaped pancakes on Valentine's Day morning, or setting aside a special time during the day each year to share the things you love about each other. Holidays almost always provide a teachable moment, and Valentine's Day is no exception. Explore the legend of St. Valentine and the history of Valentine's Day by reading books from your local library or bookstore. You can also take the opportunity to encourage reading by choosing a few of the many great Valentine's Day books available and reading them with your kids. Did you know that February is National Heart Month? Take the opportunity and use Valentine's Day to teach your children about the real human heart. The Minneapolis Heart Institute Foundation has many fun and educational links on the Kid's Corner of their website where kids can learn what their heart looks like and how to take care of it. Depending upon the ages of your children, you could also talk to them about heart disease, and consider setting a good example by donating some of your own time or money to an organization like the American Heart Association. This one seems like a no-brainer, right? But sometimes it's easy to assume that our children know that we love them and forget to say the actual words. Even if you tell them every day, tell them again. They're three simple words, but children can never hear them enough. And cards and hearts and candy aside, isn't love what Valentine's Day is really all about? Ill have to do some of these with my kids. Thanks!